Compare discounts for Hotels Motels Resorts in Clearwater Beach, Florida! Just 90 miles from Walt Disney World Resort and Universal Studios Escapes, Clearwater Beach Florida is an enchanted island of its own. With an amazing backdrop of the world's whitest beaches, the area is filled with entertainment, including the Salvador Dali Museum and Florida Aquarium. Add natural attractions like manatees along nature's coast and the lush tropical landscapes of Busch Gardens and you get an action packed vacation destination. Note: Lists are not identical. 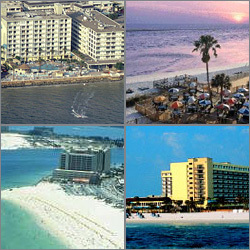 Different sites offer different accommodation options for Clearwater. Overlooking the azure waters of the Gulf of Mexico, the Sheraton Sand Key Resort is an award-winning Mediterranean-style resort located on Clearwater Beach, one of Florida's widest and most beautiful beaches. Spread across 10 acres of sandy white beach, surrounded by blue skies and the beautiful Gulf of Mexico, the Hilton Clearwater Beach Resort is the perfect gathering place for meetings of all types. Bask on a sandy beach along the sparkling Gulf of Mexico, just steps from your room at this friendly and fun resort. The Marriott Suites Clearwater Beach on Sand Key is Clearwater's only All-Suite Island Resort. Come play and relax on Clearwater Beach at the Sea Wake Beach Resort. There are a variety of activities to choose from such as water sports, boat rides, fishing, shopping, sightseeing, leisure walks along the beach, miniature golf, Clearwater Marine Aquarium, specialty shops and more in addition to fifty golf courses in the Tampa Bay area. On the bayside of Clearwater Beach, overlooking Clearwater Harbor, is the Best Western Sea Stone Resort and Suites with its casual Key West look it provides the perfect setting for your vacation or meeting. Hotel has private beach. 24hr restaurant and bar on premise. All rooms have microwave, refrigerator, safe, cable and coffee makers. Free local calls. Clearwater Beach Travelodge offers guests a Pool, a Fitness Center or Spa, Beach access, a Restaurant and a Bar-Lounge. The Newly Renovated Clearwater Central Provides 148 Guestrooms Including Efficiencies And Suites along With A Prime Location convenient To A Variety Of Businesses And Attractions. With Over 6000 Sq.ft. Of Meeting Space Groups Up To 150 Will Appreciate The Upscale Meeting Facilities And Menu Options. Relax In The Restaurant/Lounge Or Poolside On The Lush Tropical Deck Which Features A Heated Pool whirlpool And Sauna. The Belleview Biltmore Resort and Spa is a unique hotel located just 22 miles from Tampa International Airport on the inter coastal waterway overlooking the Gulf of Mexico. The Wingate Inn Clearwater is seven miles from downtown St. Petersburg and Medeira Beach, and 13 miles from Clearwater Beach. Set in a corporate park, the Residence Inn Clearwater is 14 miles from St Petersburg and nine miles from Florida's renowned beaches. Adjacent to US-19, the Super 8 Motel Clearwater is about one mile from Bright House Networks Field and two miles from Ruth Eckerd Hall. Across from the Airco Flite 18 Golf Course, the La Quinta Inn Tampa Clearwater is only a mile and a half from the St. Petersburg/Clearwater International Airport. Clearwater and St. Pete's Beaches are within 10 miles of this motel as are Busch Gardens and historic Ybor City.